We’ve lived in Minneapolis for a month now. We spent the first 9 days in our new place without furniture, which was interesting. 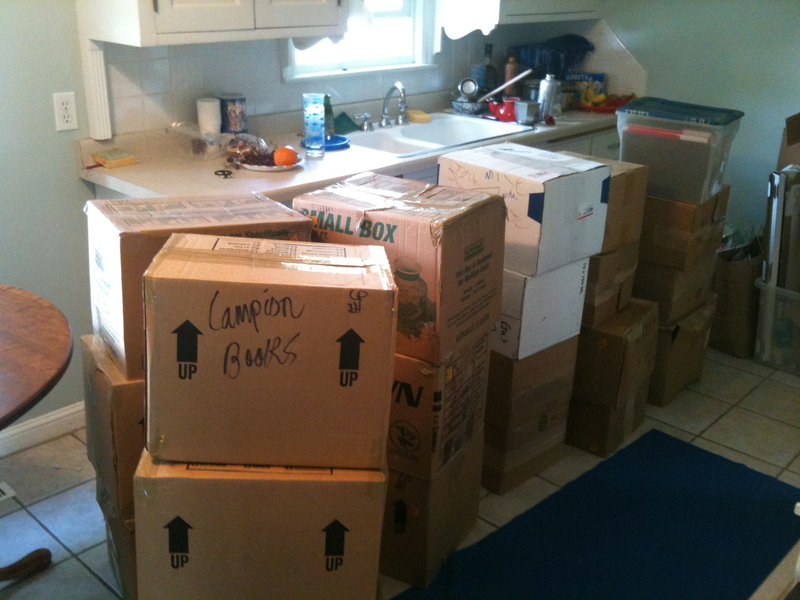 In fact, it was surprising how quickly we adapted to living with minimal stuff. But don’t worry, I’m not about to launch into a sermon about the importance of living with less. I’m glad to have a couch to sit on, pots and pans to cook with, and 200 pairs of shoes to choose from. (Well, no, sadly, I’m actually limited to a few pairs of Birkenstocks, since that arthritic toe joint has flared up again.) What made that first week of camping out on hardwood bearable was the thrill this city buzzes with when it’s summer time, the lakes and parks, and the amazing food spots we’ve discovered. There are great grocery stores, fun farmers’ markets, and countless hip cafes, coffee shops, bistros, patisseries, and pizzerias. (According to some survey that was cited in the Star Tribune last week, Minneapolis is the hipster capital of the country. I bought a $3 cup of hipster-made coffee at our neighborhood farmers’ market and thought it was so-so.) Our favorite place to eat out is the pizzeria we went to on our first night here, which is just a block and a half away: Lola. 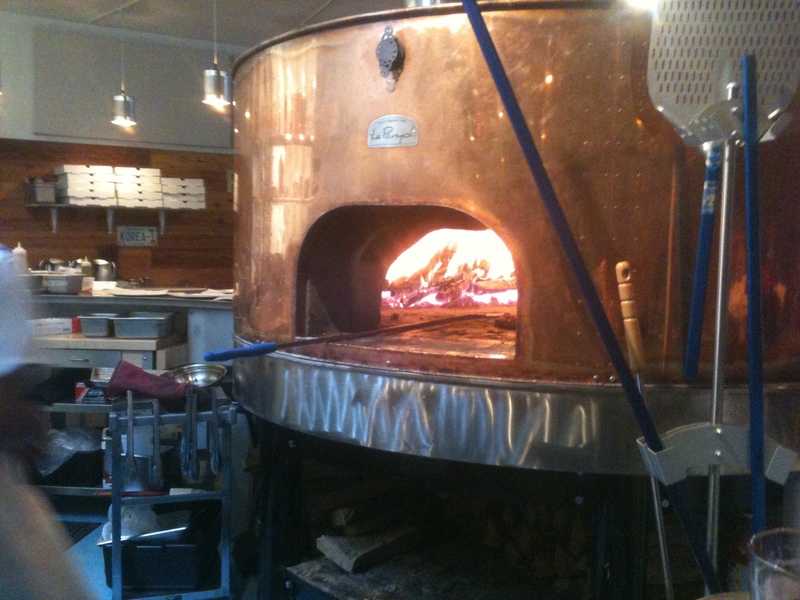 They have an enormous, round, beautiful, shiny, copper wood-fired oven in which they cook thin-crust pizzas topped with only the best ingredients. They also have the tastiest soft-serve vanilla, which you can get between cookies, unadulterated, or with a drizzle of olive oil and sea salt. The latter tastes like a vegetal twist on caramel, which is novel and delicious. 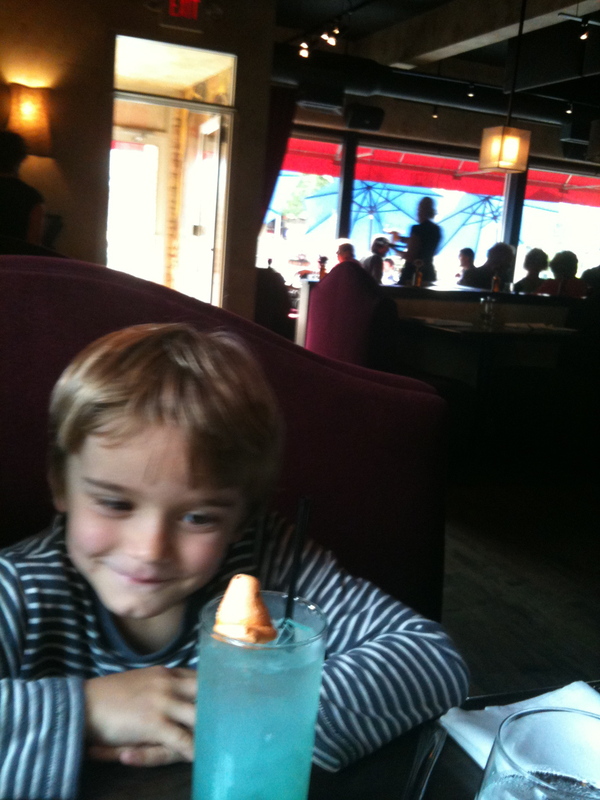 to celebrate we went to another fantastic bistro, Cafe Maude, where Jack ordered a kids’ cocktail called “Rubber Ducky,” which is topped with a Peep! And, let’s see, how many times have I been to Patisserie 46? I’ve already lost count. Our first time there was also something of an occasion. We met up with my college friend, writer Emily Sohn, whom I haven’t seen since graduation! 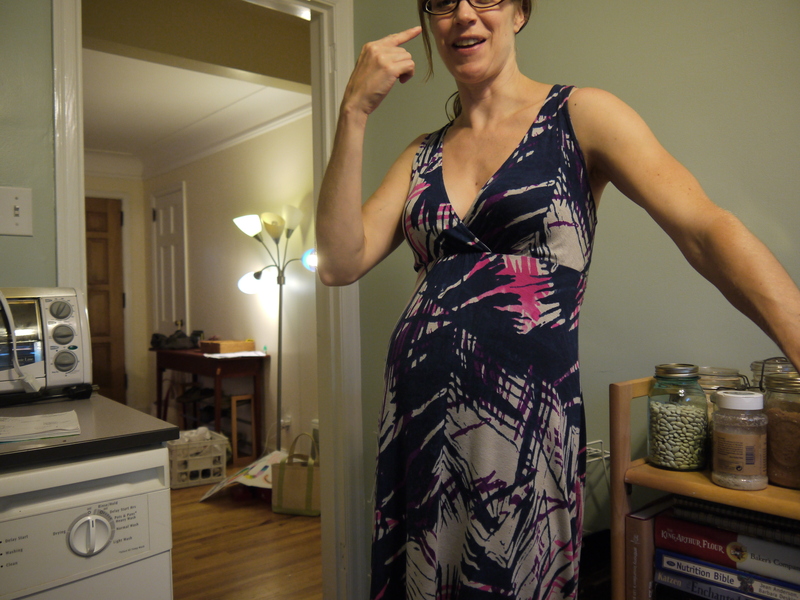 She lives here with her husband Gabe and adorable son Zach. After some morning pastries and perfectly executed cappuccini, we walked slowly to the closest park, where the little boys stripped down to their shorts and splashed around in the wading pool. The first time I tasted Patisserie 46’s delicate pastries was the week before, when I found their stand at the Fulton Farmers’ Market, which is close to home. While I ate a cherry & almond-topped brioche and drank my hipster coffee, Jack, in the mood for more savory fare, waited in line at Chef Shack for a brat with mustard. I also bought two heavy bags of produce: a gigantic head of oak leaf lettuce, English peas, baby bok choy, new potatoes, kale, cucumbers… I forget what else. We’ve been eating very well. 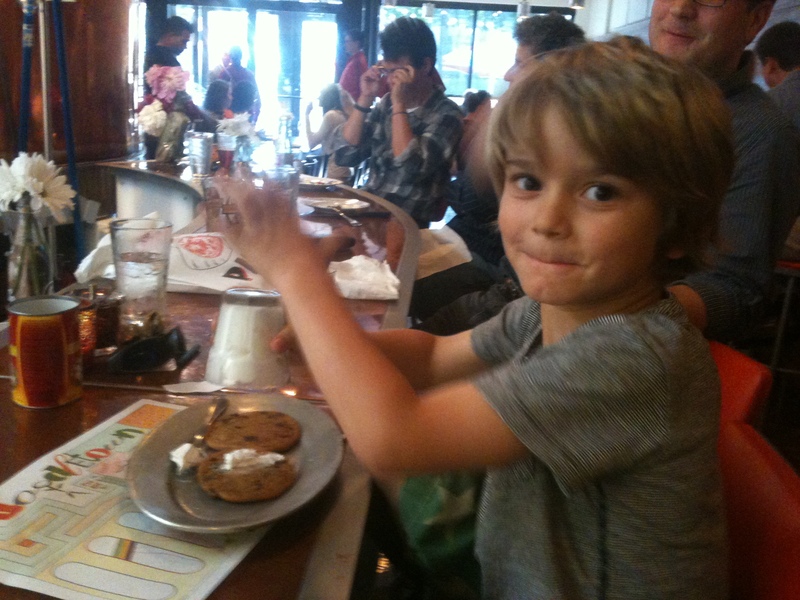 A few days later, when my parents came to visit, (in addition to eating at Lola and Cafe Maude, and then Cafe Ena) we visited the Mill City Museum, which is really the museum of flour. 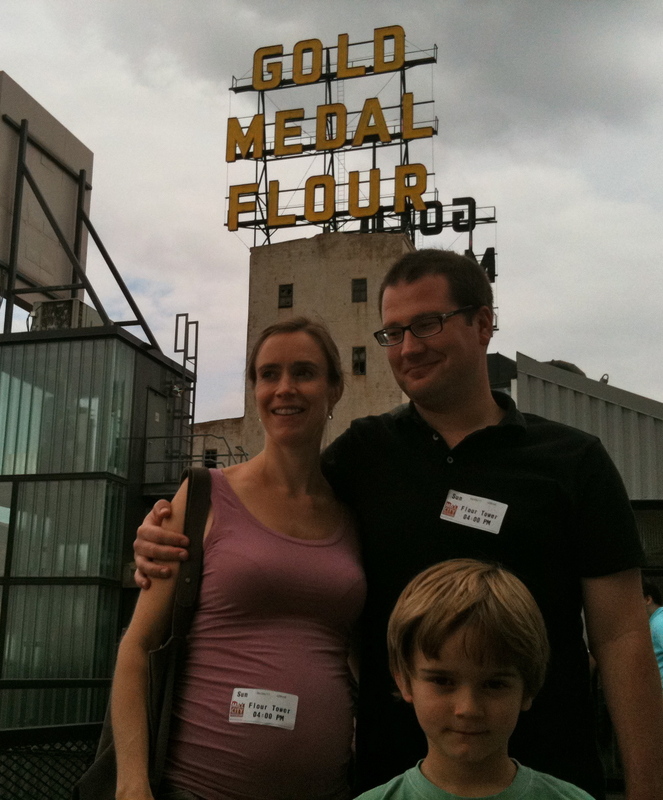 We learned about the central role of flour in the growth of Minneapolis, and stood for what must be our oddest family portrait. Jack has been busy playing with his new neighbor friend. 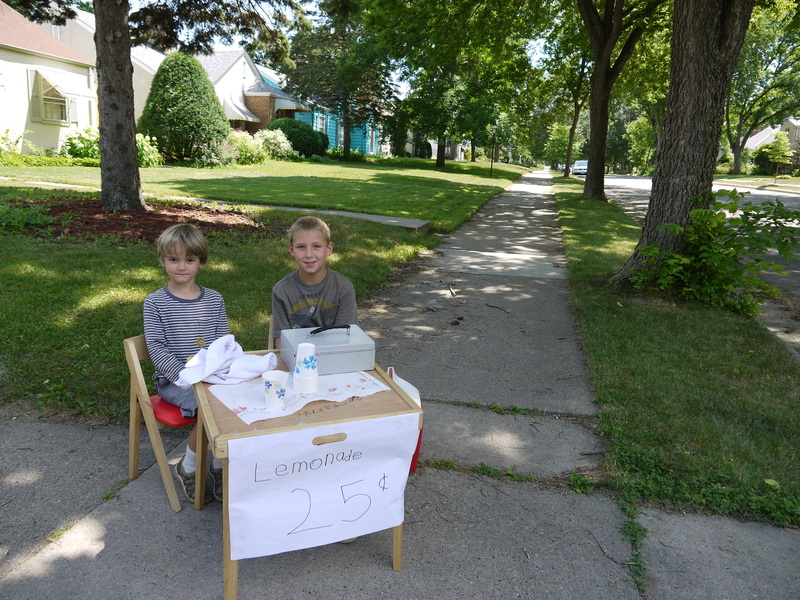 They wanted to have a lemonade stand, and the only lemonade I had was the pricey Trader Joe’s organic. 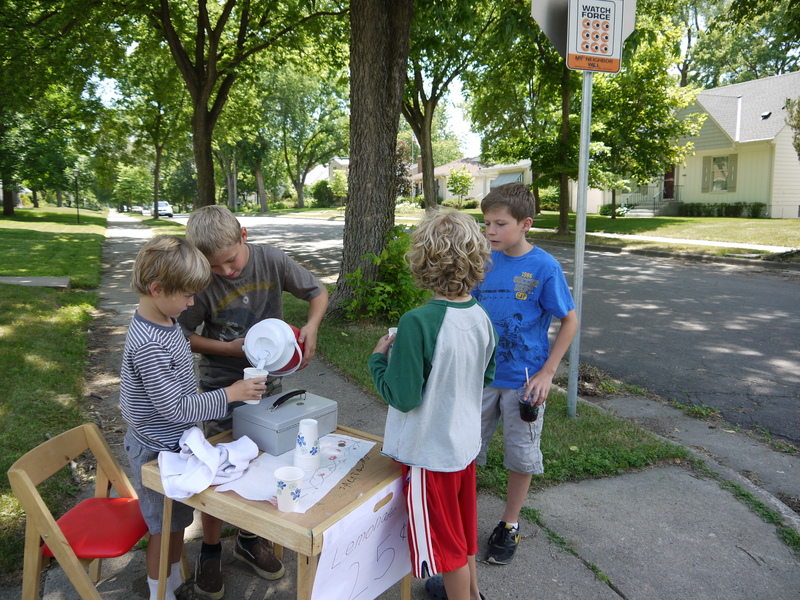 Their customers commented, they said, on how delicious the lemonade was. No crystal lite on this corner! Another day, we went to Sebastian Joe’s Ice Cream on Upton Ave., where they make their own small batches of uniquely flavored gelato-like ice creams. The first time we went, I got cinnamon. Next time they had salted caramel. Mmmm… is all I can say. They have back-garden seating, which feels Berkeley-like, and a big iron turtle to crawl on. It’s been a busy, happy, well-fed month. And even though I haven’t touched on it much here, I have been doing some cooking. 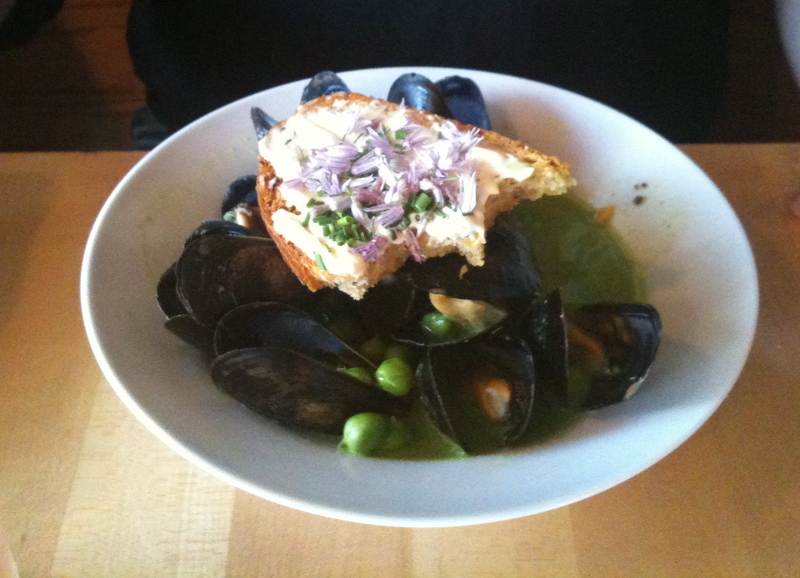 But it’s summertime cooking: quick, a little lazy, conducive to warm nights. Last night, I mixed up a pesto for our ravioli using basil from the pot on the front stoop and peas from a local farm. The peas gave it a bright color and sweetness that was a refreshing change from the basil pesto I usually make, which always contains the evidence of an over-zealous garlic pusher. If only I could extend the evening with a few glasses of rosé…. Instead, I’ve been reading Clarissa.